According to director of the Kazakh MFA Department for Asia and Africa Aidarbek Tumatov, today’s Astana process of signing a new memorandum on tensions de-escalation zones will allow to stop bloodshed in Syria and initiate a new political dialogue. According to the document at our disposal, 4 zones of the escalation of tensions are to be created in Idlib governorate, to the north of Homs, Eastern Ghouta and in the south part of Syria. The exact coordinates of the zones will be determined by guarantor states May 22. The working group will be created within five days. It is expected that the usage of arms will be prohibited inside the zones and the humanitarian organizations will be provided with all the necessary assistance. The measures on restoring urban infrastructure, water supply and other life support systems will be also taken. Along the de-escalation zones borders it is planned to create lines of demarcation to prevent ceasefire violations. There also should be checkpoints for civilians, delivery of goods and humanitarian aid. It was also said that Iran, Russia and Turkey act as a guarantor of peace and security in the region and at the same time support the territorial integrity and independence of Syria. Inside Syria Media Center tried to find out opposition’s point of view on this issue. The head of the Syrian opposition’s Moscow Group Qadri Jamil said, that all sides support the idea of creation such zones and their presence can actually stop bloodshed and create favorable conditions for political settlement in Syria. Mahmoud al-Hamza, a member of the Syria National Council also stated that he welcomes any steps aimed at reducing violence as the Syrian are tired of war and yearn for peace. He stressed that such an initiative should be implemented. Along with this, some analysts express their concern regarding that it’s not clear which foreign troops may be placed in Syria to provide security for the four-zone perimeter in the country. Some observers call upon strengthening the security for civilians not only inside the safe zones. 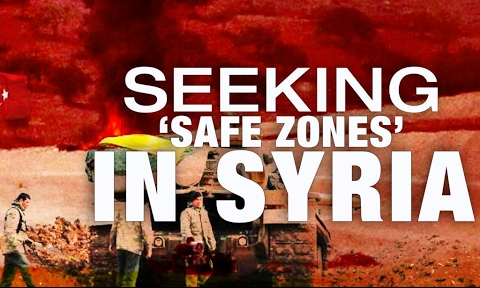 Not so long ago the U.S. put up an initiative to create “no-fly zones” and “safe zones” in Syria while Turkey offered to set up refugee zones along the Syrian-Turkish border. However, there were concerns that Washington and Ankara may support the Syrian opposition under the pretext of a humanitarian operation. According to CNN, Donald Trump is ready to discuss and even adopt the initiative. To sum up, such zones is a decisive step towards the settlement of the conflict. It’s important that their creation goes side by side with the political dialogue. Meanwhile, a lot will depend on how scrupulously the parties will comply with the memorandum.